More than 10 million homes worldwide already have fiber-to-the-home broadband connections because the technology holds many advantages over current technologies. It is a passive network, so there are no active components from the CO- or central office to the end user. This dramatically minimizes the network maintenance cost and requirements, as well as eliminating the need for a DC power network. It is a single fiber to the end user, providing revenue-generating services with industry standard user interfaces, including voice, high-speed data, analog or digital CATV, DBS, and video on demand. FTTH features local battery backup and low-power consumption. 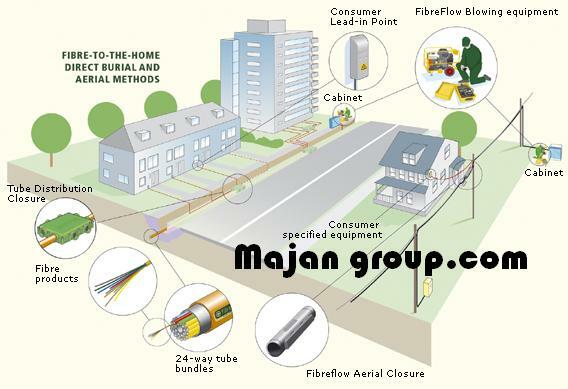 FTTH can be used with bundled service and is reliable, scalable, and secure. The FTTH network is a future-proof architecture. Fiber-to-the-home broadband connections offer faster connection speeds.A key benefit to FTTH -- also called FTTP, for "fiber-to-the-premises" broadband -- is that it provides for far faster connection speeds and carrying capacity than twisted pair conductors, DSL or coaxial cable. For example, a single copper pair conductor can carry six phone calls. A single fiber pair can carry more than 2.5 million phone calls simultaneously. Fiber optics uses light signals to transmit data. As this data moves across a fiber, there needs to be a way to separate it so that it gets to the proper destination. There are two important types of systems that make fiber-to-the-home broadband connections possible. These are active optical networks and passive optical networks. Each offers ways to separate data and route it to the proper place, and each has advantages and disadvantages as compared to the other [source: Ftth Council]. An active optical system uses electrically powered switching equipment, such as a router or a switch aggregator, to manage signal distribution and direct signals to specific customers. This switch opens and closes in various ways to direct the incoming and outgoing signals to the proper place. In such a system, a customer may have a dedicated fiber running to his or her house. A passive optical network, on the other hand, does not include electrically powered switching equipment and instead uses optical splitters to separate and collect optical signals as they move through the network. A passive optical network shares fiber optic strands for portions of the network. Powered equipment is required only at the source and receiving ends of the signal. In some cases, FTTH systems may combine elements of both passive and active architectures to form a hybrid system. Passive optical networks, or PONs, have some distinct advantages. They're efficient, in that each fiber optic strand can serve up to 32 users. PONs have a low building cost relative to active optical networks along with lower maintenance costs. Because there are few moving or electrical parts, there's simply less that can go wrong in a PON. Passive optical networks also have some disadvantages. They have less range than an active optical network, meaning subscribers must be geographically closer to the central source of the data. PONs also make it difficult to isolate a failure when they occur. Also, because the bandwidth in a PON is not dedicated to individual subscribers, data transmission speed may slow down during peak usage times in an effect known as latency. Latency quickly degrades services such as audio and video, which need a smooth rate to maintain quality. Active optical networks offer certain advantages, as well. Their reliance on Ethernet technology makes interoperability among vendors easy. Subscribers can select hardware that delivers an appropriate data transmission rate and scale up as their needs increase without having to restructure the network. Active optical networks, however, also have their weaknesses. They require at least one switch aggregator for every 48 subscribers. Because it requires power, an active optical network inherently is less reliable than a passive optical network. In an FTTH system, equipment at the head end or CO is interfaced into the public switched telephone network (PSTN) using DS-1s and is connected to ATM or Ethernet interfaces. Video services enter the system from the cable television (CATV) head end or from satellite feed. All of these signals are then combined onto a single fiber using WDM techniques and transmitted to the end user via a passive optical splitter. The splitter is typically placed approximately 30,000 feet from the central office (CO). The split ratio may range from 2 to 32 users and is done without using any active components in the network. The signal is then delivered another 3,000 feet to the home over a single fiber. An ideal FTTH system would have the ability to provide all of the services users are currently paying for, such as circuit-switched telephony, high-speed data, and broadcast video services. At the home, the optical signal is converted into an electrical signal using an optical electrical converter (OEC). The OEC then splits the signal into the services required by the end user. Ideally, the OEC will have standard user interfaces so that special set-top boxes are not needed to provide service. These interfaces would include RJ11 jacks for telephony, RJ45 jacks to high-speed data, and 75 ohm coax ports for CATV and DBS service.